Can you feel it? Valentine’s Day is next week and it seems as though everyone is full of that loving feeling. But why should Valentine’s Day be the only day where you show your significant other how much you care for them? Why shouldn’t you do it each and every day of the year? When you wake up in the morning, let them know how happy you are to see them and hear their voice. Before you go to bed, remind them once more! Something that takes very little to make happen but can mean so much. Whether those words are “I love you” or “You’re the best”, it doesn’t matter. Sometimes it’s nice to hear them, especially if they’re out of the blue. It seems simple, but try and recall the last time you gave them your full attention. Just taking time to put all of your focus on hearing your loved one can communicate more than you imagined. See? 4 simple ideas to make Valentine’s Day last the whole year through. What a great coat! The bow detail is just perfect. I have a similar coat with a bow detail in pink and it’s one of my favorites. You can never go wrong with a bow! And the red is so perfect for Valentine’s Day. I love your ideas for making Valentine’s Day last all month long. I hope you guys had a great weekend! Happy Monday, Shauna! Your coat!!! It’s so cute and I love it for V-Day! 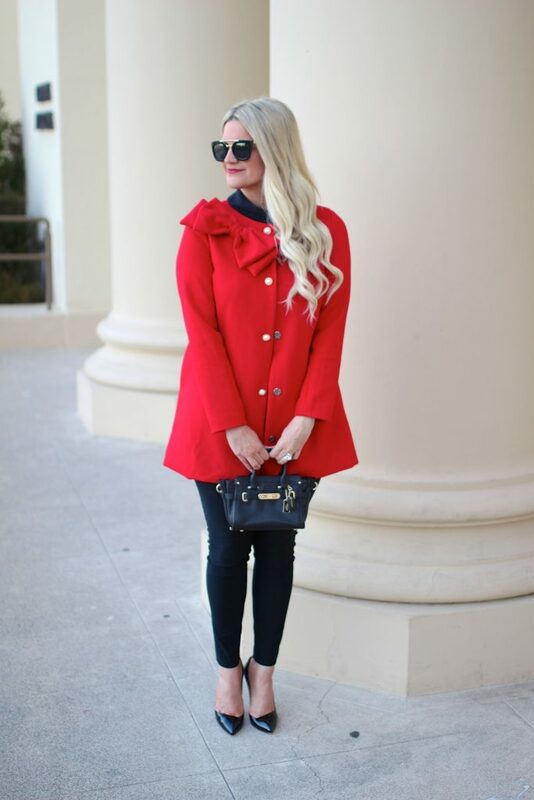 What a pretty red coat!! This is so sweet – love these ideas! I could definitely do these more often. Your coat is adorable! Such a cute coat! Love that color on you! I love your coat. Red suits you. So nice and fancy. ah! so sweet and simple! love your coat as well–Happy Tuesday!!! Love these tips- simple but seriously huge impact! And your super femme + festive coat is gorgeous, doll! Your tips will help create a connection and allow others to feel loved! I love your outfit especially your coat. These are such nice things to do with your loved one on valentines day and every day! 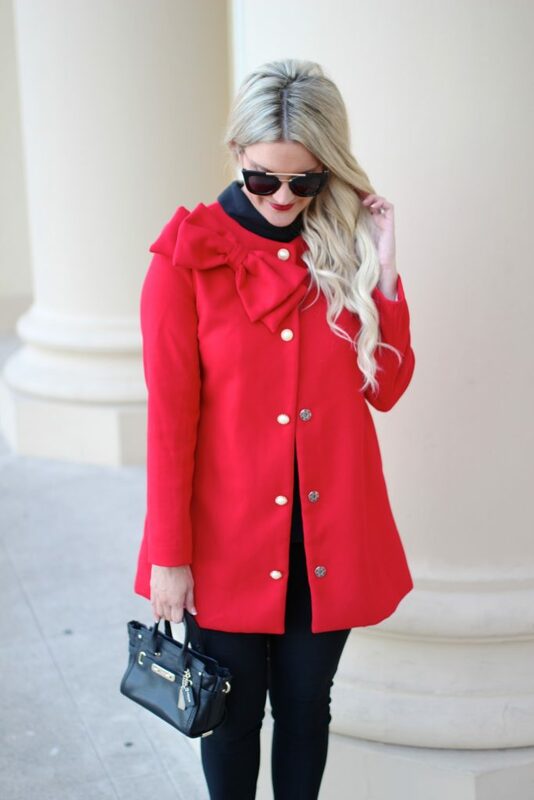 This coat is so beautiful, love the bow detail! 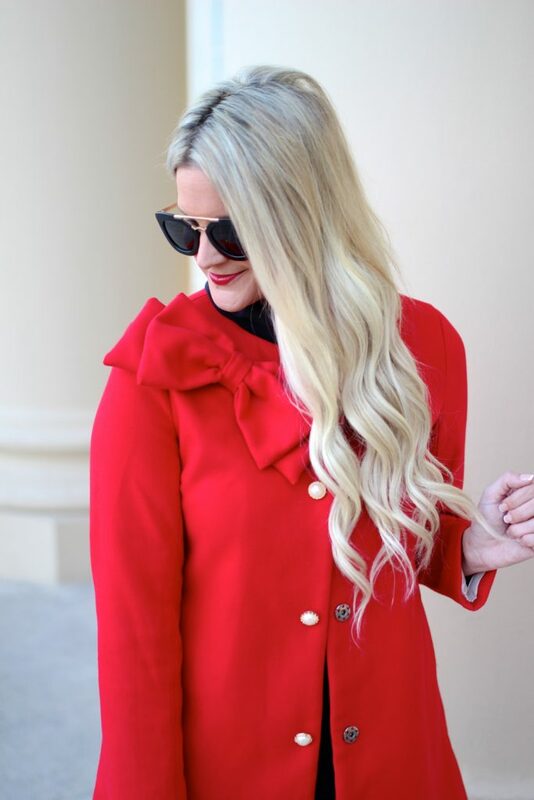 That is really a beautiful red coat that makes a statement! So true! I am a big hugger and it is so important to appreciate your significant other. Your coat really speaks love dear! So pretty on you.